2017 Update: I wrote this post on The Year Road Homeschool about five years ago in 2012 (gulp!). Much has changed in our family’s life since then. Now as we have toddlers up to teens and are currently homeschooling preschool, elementary, middle, and high school levels. We are not only still gentle year-round homeschoolers for all the same reasons listed below, but we also consistently homeschool in the afternoons and even early evenings these days. You can even see what late pregnancy homeschool days look like here. This is because we have a major need to get outside, explore our forest, and work out energy during the first half of the day. Also in working through life with me running a business from home as a working homeschool mom, and various outside activities and teen work/life/job schedules, this is the natural flow that has developed over the years. I’m a big believer in leaning into whatever works. 🙂 If you’re interested you can see our 2016-2017 homeschool routines and curriculum plans here for our preschool up through high school learning levels. You can also read and watch a day in my life as a homeschool mom of seven. This is the time of year when many homeschoolers are finishing up their lessons. Test are taken, workboxes are put on shelves, pool passes are warmed up, and the Summer months are calling. No matter your homeschool schedule we all agree: In the homeschooling lifestyle the learning never ends, and the world is our classroom. Flexibility ~ Homeschoolers have lots of flexibility, to begin with, and it’s a gift. With year-round homeschooling, we’re able to customize our school a step further. Custom schedules can be made around dad’s work schedule too. We even took an entire year to travel full-time with my husband on his job. The trip was free, (sometimes I mention how we lived in a Marriott for a year and ate Olive Garden for dinner every night; it was truly a year of “living on vacation”) we spent our daylight hours exploring our surroundings and did our table work in the evenings and on some weekends. Travel opportunities ~ In March our family went to the Teach Them Diligently Convention in South Carolina. Part of our school that week was meeting Ken Ham. It was a good week. 🙂 We also take advantage of off-season vacation deals, like going to Florida in January and amusement/water parks in September, We’re able to thoroughly enjoy these travel opportunities without feeling guilty or pressured about our school schedule. Family & Fellowship ~ We love to have a family over for what I call an “Iron Sharpening Iron Fellowship Day.” On these days table work can still be done in the mornings and friends come over at lunchtime. Continuity ~ No need to spend the first month of a new school year reviewing from the previous year. We just keep on moving forward, one day at a time. For our family homeschooling, year round was a major step in experiencing for ourselves the lifestyle of learning that you hear so many homeschoolers talk about. Field trips & special events~Whether it’s a trip to the Civil War battlefield or taking advantage of free days at the National Parks, with year round homeschooling we maximize our exploring opportunities. Steady routine ~ We thrive on routine. More importantly, I thrive on routine. If my family takes off longer than a week, our routine gets very slack; before I know it life is feeling out of balance. I’m sure there are better moms than I who can keep steady life moving along over breaks. This Momma here has a hard time managing the house, the kids, the life when we get off our routine. Remember, homeschool survival mode happens, and in those seasons year, round homeschooling is your friend. When do you start the next grade level? This is an easy question for us because we don’t focus on grade level. Several years ago we moved beyond the scope and sequence to allowing our children move at their natural pace. If the 8-year-old does work alongside the 11-year-old, that’s okay. If the 5-year-old works on literature lap books with her big brothers and the 2-year-old begs for another chapter of Old Yeller; that’s our plan. Our children keep working on their books until they’re completed. Then we start the next one. This can happen ahead of time in February or the following October. How do you schedule your summer days? You can read our current homeschool life schedule here. In the Summer we have our normal “daily life” schedule 4-days per week. Our table work time is moved from morning to afternoon. In the mornings after breakfast, the kids head straight for the trampoline, zip line, tire swings, and other outdoor fun. We come back inside for lunch; followed by our 2-hour table work time during our little boy’s nap. Right after table work, it’s back outside. If you’ve read Holy Spirit-led Homeschooling for any length of time you’ve no doubt seen the picture below. For me this picture sums up the heart of our summer days; quilts spread out under the shady tree, stacks of books, precious memories. Have you always schooled year round? No, we haven’t. 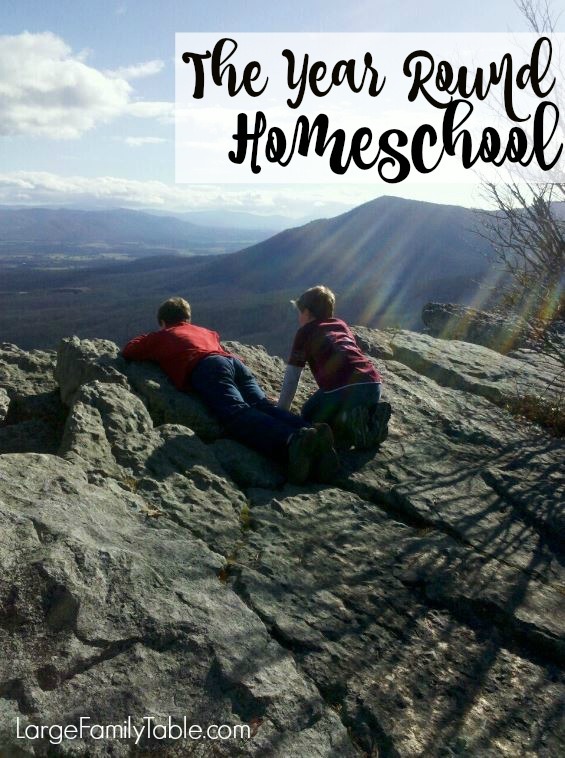 Our first year of homeschooling was so hard (hear me…every day ended in tears) that my son and I needed that first summer off to learn to enjoy one another again. The following year we were in such a good flow that I saw no reason to stop or change things (read this Letting Go and Letting God: How the Lord Took Over Our Homeschool). A few years later we took another summer off after having a set of foster children that left us drained; around that same time, we had our 4th baby, Gabriel. We needed that summer to vegetate and recover. However, by August 1st we started the next school year. What about keeping records and my state laws? Yup, that state law question. To find out exactly what your state requires you need to contact HSLDA. We have been members of this organization for years and highly recommend it. Also, Homeschool Legal Advantage is offering free first year memberships. After your first year with HLA your subsequent years are based on donation. I feel legal membership for homeschoolers is very important. These organizations work diligently to keep the homeschool freedom that we enjoy available. For record keeping, I take lots of pictures, keep notebook samples of my children’s work, and keep copies of annual test scores. An at home test that I also recommend is the CAT Testing. It can be administered at home, has year-round service, and is only $25 which includes scoring. Again, this test is accepted in many states, but you need to check the laws where you live. As long as you’re seeking the Lord and His best for your family and homeschool life you can’t go wrong. We’re currently homeschooling year round because it’s what works best for our family dynamics. So, what about your family, do you homeschool year round? What kind of schedule works for you? No right or wrong answers. Let’s share and give one another some great ideas! We homeschool year round and find it is the best way for our family. Once the weather warms up here in central Ohio we will hit the parks, trails, whatever and make the most of outdoor learning. There is just something wonderful about continuing a light but education filled schedule during these months that give our schooling the added boost it needs coming off the cold winter. For example we have a creek in our yard and a huge veggie garden which means creek studies and botany for everyone! Also, one of my children has Dyslexia and keeping a steady pace through out the year helps keep him on track and focused. We may take a couple weeks off in the summer but there is always some learning going in during that “break” as well. We are making the move from ps to hs this year 🙂 the plan is to officially start at the end of July and go year round. I am really looking forward to this new adventure. As we plan to embark on our own homeschooling journey next fall….I have been trying to think about and contemplate what our homeschool will look like and be like for us! It’s so hard to break out of the public school mentality…well it is for me because I graduated from public school. It’s engrained into me! Im hoping the Lord helps break us free of that and helps us become who we are supposed to be and mold our homeschool. We are even considering starting up our school in July or August! GASP! This will get the families attention!LOL! I know it is hard to break the mold. 🙂 I went elsewhere for 12 years of school too, and homeschooling is a completely different world. Even our Summers that we’ve taken off we have started school back the 1st week of August. Blessings to you! the first year of homeschool it was just me and my highschooler. then wmy husband and i decided to pull the other two children from public school and they will never go back! year round homeschooling works great for us. almost done our second year. taking a short break and into the next year we go. love homeschooling!!!!! We’ve been HS’ing from the beginning, 3 years, and up to this year, we took summers off. It was necessary for my oldest dd because she was young, and then last summer, we moved, so we needed th break to get settled. But this year, I plan to do it year-round. Partly because I learned that if my oldest dd takes more than a week off, she looses her “groove” and it takes at least a week to get her back on schedule. And because we have baby #4 comming in November, so I won’t feel so panicky when we take a month of so off when the baby comes. We generally go year-round, though we take most of December off. We just finished the last week of our spine curriculum last Friday (Illuminations, by Bright Ideas Press), and so now we’re shifting gears for a little bit to do a unit study on Flight. It’ll tie in nicely with our trip to the Outer Banks afterwards. In June, we’ll have our state homeschool convention, and a week of testing (my husband’s choice, it’s not required and we don’t submit it). After that we’ll start in with the Year 3 of Illuminations! Of course, all of this is just our plan – we’ll have to see if God wills it! We have been homeschooling for 6 years on a public school schedule. We even took off the same holidays and in-service days because I feared my kids would be jealous of their public schooled friends. This year we switched to year round homeschooling. We typically do 3 weeks on 1 week off, but we are flexible if we need to work around opportunities that dont fall into that pattern. This new schedule has been such a blessing. It has freed me from a burden I didn’t realize was so heavy. Trying to school to someone else’s clock or calendar is more stressful than I realized. I used to spend most of my summer coming up with a years worth of lesson plans for three kids. We were almost always off schedule by Christmas and the spring was a rush to get everything done “on time.” Now, I take the off week to plan for the next three. This keeps my expectations much more realistic and allows my kids to delve into topics they find interesting without “putting the whole year out of whack.” We are no longer slaves to whatever idealistic view I had the summer before. Also, we live in Texas, and the summers here are just too hot to enjoy. Now we have time to explore outside opportunities when the weather is nice. My kids aren’t jealous of their public schooled friends. It’s the other way around. I wish I had let go of my fear and my attachment to the public school system years ago, but I know I wasn’t ready then. II am now, and my family is much happier because of it. I’m a missionary wife and mum in Australia. They homeschool year round here, starting in January. They go for 10 weeks, take 1 week off (this is Easter break), 10 weeks, take 4 weeks off, 10 weeks, 1 week off, then the last 10 weeks and Christmas break, which I think is 5-6 weeks off. We just moved here last November so this is our first school year. I’m really enjoying it. We school year round and with my husband’s military schedule this has been such a blessing for us! We usually do more unit studies during the summer, and we’ve actually found that when we do them the neighbor’s children who are out of school like to come over and learn with us. I love the flexibility of being able to spend time as a family whenever my husband is home, and schooling on the road as we move. Two words describe why we homeschool year-round … TEXAS WEATHER. Anyone that lives here understands the scorching summers and completely unpredictable weather the rest of the year. We love being flexible in the fall and spring, and love staying inside reading books and doing math in the summer heat. We school outside on sunny warm winter days in January, and huddle up inside on stormy May days. It is crazy but it works! WOW! I love your plan. I’m new to your blog so I’m off to look around more! 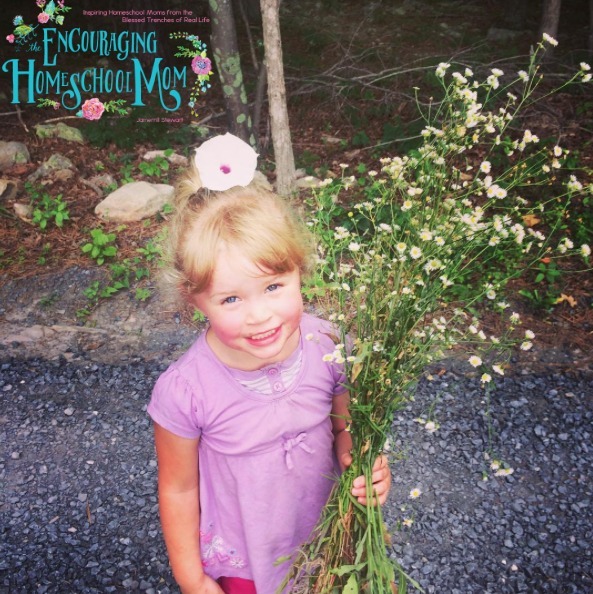 If you have time, I would love for you to come link up at Homeschooling on the Cheap! Hi! It’s my 1st time by your site and I love it…I homeschool 4 boys and it does seem that we are headed in the year-round direction. We have so many breaks all year long, and my boys are competitive surfers so there is travel and even just times where they need to train. I LOVE the idea of being “free” to take breaks when we need them…So, we’ve all agreed to do a mini-summer break, then hit the books again. I’m really excited about it! I’ll be back!! ALoha! This is a new topic for me too, new in execution really. I have been considering homeschooling year round, but have always dreaded it a bit. I remember LOVING those summers off when I was a kid…and I enjoy them now too. My kids are a little ho – hum about the whole idea of ‘school’ in the summer. Thanks for the words, the ideas, and the encouragement to follow God’s plan for my homeschool. Even when we do take summers off, we typically start back mid – August. We always vacation in November so this gets us ‘ahead’. I like the comment made above about bringing down the pressure with a few weeks on and a few weeks off. I think that would help me to not feel so behind too since I would have that week to catch up on some things around the house. This really spoke to me. We had to take April off due to a series of circumstances and I’ve been thinking of just rolling into year-round-homeschool since we’ll be going into the summer anyway. We have a very relaxed set up though; probably too relaxed! Just yesterday, the mother in law was drilling my son on spelling words (which he, of course, didn’t know) and asking them about our schedule and test scores and why we always seemed behind (according to her standards as a private school teacher.) It would be so much nicer if other people wouldn’t apply their pressures to us! Anyway, bit of a digression. 🙂 This post is inspiring to me today. I needed that! Great post:) Just found your blog and I’m so glad I did! We are relaxed homeschoolers… probably more interest led learners than anything else. We learn year round as well. We hs year around taking breaks as we need them. AR summers are hot, sticky, and buggy so schooling in the summer just makes sense. We have rather a laid back schedule with core subject in the morning and productive free time the rest of the day. We also take fridays off except for math so its really not stressful to school all year long. This gives us the freedom to take time off whenever we need to and to be available to our church family when they need us. They are mostly homeschoolers as well so we spend lots of time together and even sometimes teach together. This is a journey so we might as well enjoy it and our kids as much as possible while we’re on it! God bless you on this decision. You will never regret it.